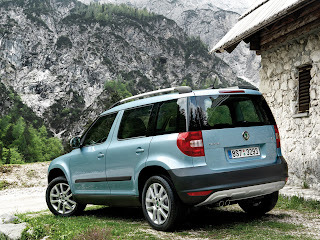 The Škoda Yeti (Typ 5L) is a five-door five-seater compact SUV model built by the Czech car manufacturer Škoda Auto. It was introduced at the 2009 Geneva Motor Show in March, as the division's first entry into the popular SUV market. 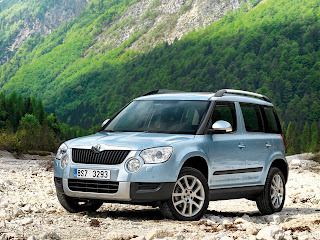 An announcement was made in late 2010 that Škoda Yeti will be built in China by Shanghai-VW in 2013. In most of the EU, the Yeti is available with three different trim levels: Experience, Ambition andTrack (or Active in some markets). However in the UK it is available in five trim levels, E, S, SE,SE Plus and Elegance. In India, it is available in "Active", "Ambition" (also called "Ambiente") and "Elegance" trims. Its luggage capacity, aided by the 'VarioFlex' rear seats, ranges from 405 litres (14.3 cu ft), up to 1,760 litres (62.2 cu ft) when the rear seats are removed. It was named Family Car of the Year in 2009 by Top Gear Magazine. And according to theEuropean Car of the Year website, the Yeti was placed fourth in the 2010 award. In June 2011, Škoda built the 100,000th Yeti. The Škoda Yeti has been awarded a 5-star safety rating by the Euro NCAP. It scored 92% adult occupant protection in the frontal and side crash tests, 78% child occupant protection and 46% in the pedestrian safety test. It also scored 71% in the Safety Assist equipment, as it comes with standand driver/passenger seatbelt reminders. It also includes Electronic Stability Programme (ESP) with Anti-lock Braking System (ABS), Hydraulic Brake Assist (HBA), Anti-Slip Regulation (ASR) and Electronic Differential Lock (EDS) - which is currently standard equipment on most variants throughout Europe and optional on others. Protection against whiplash injury in the rear-impact (whiplash) test was also good. It can be ordered with up to 11 airbags (dual front, front side torso, rear side torso, front and rear side curtain, and driver's knee airbag). The powertrain offerings in the Yeti include a range of internal combustion engines, all of which are four cylinder (I4) four-stroke turbocharged and EU5 emissions standard compliant. petrol engines are all fuel injected and diesel engines are all common rail (CR) Turbocharged Direct Injection (TDI) with diesel particulate filter (DPF). Most engines are offered with six-speed manual transmissions, with a five-speed manual being reserved for front-wheel drive only cars with the 81 kW TDI engine. Currently, the Volkswagen Groupseven-speed Direct-Shift Gearbox (DSG) can be ordered for the 1.2 TSI only. The six-speed Direct-Shift Gearbox (DSG) has been available for the 2.0 CR 103 PS diesel engine since May 2010. The four-wheel drive variants utilise the latest fourth-generation Haldex Traction multi-plate clutch to transmit the drive to the rear wheels, and all drive layouts include fully independent multi-link rear suspension first seen on the Volkswagen Golf Mk5 to complement the fully independent front suspension. Since its introduction in 2009, the Yeti has been well received by the public and the press. The Yeti has received a number of awards, including some high profile and coveted ones. In 2009, it won the Top Gear Magazine's Best Family Car. In 2010, it won the Auto Express Car of the Year Award. The Škoda Yeti also received numerous awards from Total Offroad Magazine in 2011. The Škoda Yeti also featured in the most searched for vehicle on the popular car review website Honestjohn, until early April, 2011 and was voted as the first Honestjohn Car of the Year award. In 2011, the Yeti appeared on BBC's Top Gear programme. Presenter Jeremy Clarkson declared it to be possibly the best car in the world and used 20 minutes of the programme putting the Yeti through a number of challenges to support his point. Due to this broadcast, the Škoda UK website temporarily overloaded and the Yeti became a trending item on Twitter. Last updated on 8 August 2013 at 12:26.